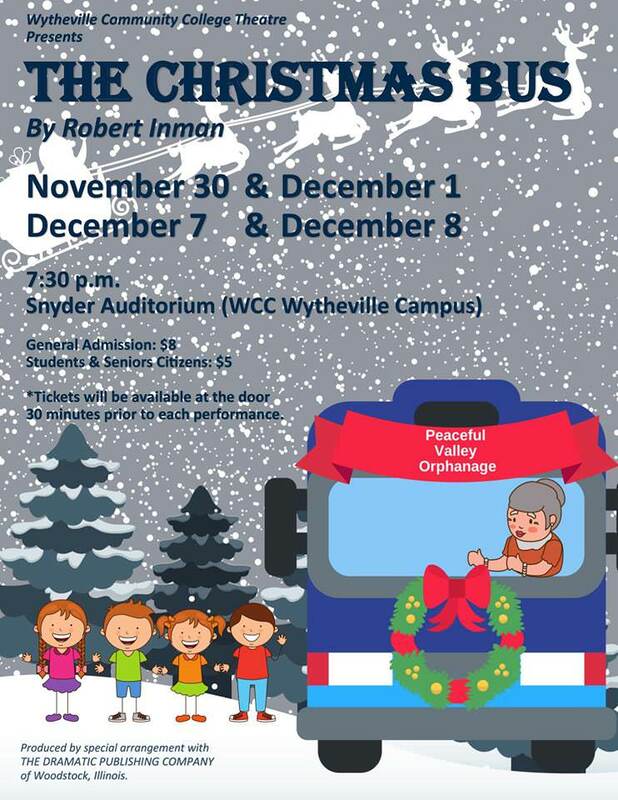 Wytheville Community College Theatre presents the family friendly play "The Christmas Bus" with four performances starting Friday, November 30, 2018 and ending Saturday, December 8, 2018 starting at 7:30 pm each night in Snyder Auditorium on the campus of Wytheville Community College . The Christmas Bus, a family friendly holiday musical by Robert Inman, tells the story of one Christmas at the Peaceful Valley Orphanage. Miz Frump, the director, wants to give the orphans a special holiday treat, but there are many obstacles. Will she succeed or will the busybodies ruin her plans and Christmas?! Tickets are $8.00 for adults and $5.00 for students and senior citizens. Tickets will be available at the door 30 minutes prior to each performance. To view the event flyer, visit: https://i.imgur.com/bPAAunf.jpg. For more information, visit: https://www.wcc.vccs.edu/news/christmas-bus-comes-wcc-stage or https://www.facebook.com/WCCTheatre.